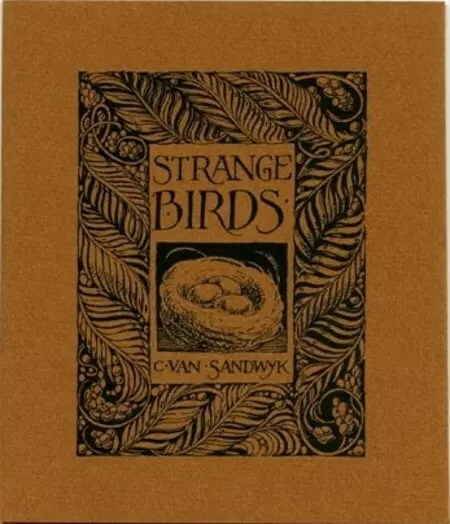 Charles van Sandwyk’s artworks often blend the fantastical with the natural world, reflected in his first two books being a collection of fairy people of the forest and a selection of ‘neighbourly birds’ from Canada. The video linked above looks at some of his beautiful avian illustrations by reviewing an assortment of his beautiful hand made books that examine owls, crows, parrots, and other feathered friends. Strange Birds is one of Charles’ earliest books, with pen and ink drawings of exotic birds in art and poetry, printed offset. It features French flaps and hand-sewn pages. The book was released in 1991, with 700 copies in tan paper wraps and a further 300 in maroon wraps. Charles’ first edition of Neighbourly Birds of the New World (Canada) was actually published in 1987 in a very small release of 126 copies. It is a collection of illustrations about different birds seen in Canada: robin, wren, warbler, crow, heron and pelican. The edition I am showing here was released later, in 1995. It is based on the original book, but includes ten new colour illustrations. 2000 copies were printed for this edition. Sketches From a Tropic Isle features a collection of annotated sketches of the Fiji Islands, where Charles spends part of his time each year. The book was released in several editions, with laid-on illustrations of a lizard, parrot, palm or turtle. This edition was limited to 1,500 copies, with a small number also bound in leather and embossed in gold. Sketches from the Dream Island of Birds is another re-release of an earlier limited edition book. This hand-sewn edition in metallic card wraps from 2005 features tipped in watercolour illustrations and a beautiful fold-out triptych. This trade edition, which was released in 2000 copies, also won an award in recognition of excellence for its superb craftsmanship. Full Moon Eyes is a 2012 poem by the artist, subtitled An Ode to the Wisdom and Forbearance of Owls. It features several multiple gorgeous owl illustrations (and one bright painter mouse). The book is hand-sewn with French flaps, hand-sewn pages and the fold-out triptych is an owlish reinterpretation of a “Life is Art” work first developed in 1997. 2000 copies of this edition. I Believe: Two poems and a hidden thought also came out in 2012. (The subtitle is printed backwards on the title page in mirror writing.) The maroon coloured paper jacket was the standard edition, of which 2000 copies were released. A limited edition of 125 copies in the maroon jacket also included a copperplate etching of “Crow with Field Guide to Humans”. The book came with an adorable ‘literary mouse’ bookmark. The end-papers are marbled and the ‘hidden’ thought is folded and sewn in under the flaps. Splendid Crow (also known as ‘Life is Art, Art is Life’) is a small 6-page booklet that opens out to reveal three wonderful tipped in illustrations making a decorative triptych. The booklet was released in several different coloured wraps and internal page colourings, with just 20 printings of each.